Lower: God takes all sorts of ordinary people by surprise in these readings. I thought a surprise slide would be appropriate so i took Microsoft free clip art to pieces and put it back together again. Found in 2000 Years of Prayers by Michael Counsell, Canterbury Press, Norwich, 1999, page 57. Thanks to Diane Wookey for sourcing this for me. To those who confess: forgiveness. On us who are weak and sinful: may God's mercy come and overshadow us forever! Found in Celtic Prayers by Robert Van De Weyer, Hunt and Thorpe, 1997, ISBN 1856082814, page 43 (pictured at left). This is a great call to worship and/or opening prayer not just for this particular week but for any week. Found in Building Worship Together by Martha Keys Barker and the Fisherfolk, Celebration,1983, ISBN 0906309212, page 38 (pictured in an earlier blog). What was it that first impressed you about God? What is it now that impresses you most about God? How does both the Luke reading and the film clip affirm that God can use each one of us? How does Jesus' response to Peter differ from that of Simon's minister to Simon. What can we learn from the two responses? Start the clip where Neo's call comes via his phone and stop the clip when he is caught just after his inability to take a great leap (of faith?). Both Neo and the disciples are called while at work. Share some personal experiences of call. Neo messes up his call; how does following Jesus out in to the deep water feel to you? Show the clip where Truman Burbank escapes. Questions: Truman leaves everything behind; the disciples drop everything to follow Jesus. Do we do have to do the same? How hard is it topush out into the deep water like Peter, or go through the door like truman? Peter got fish, Truman got a new life. What will we get? Have you been meeting God face to face lately? Is their a gap between God and you at the moment? How do you think God could bridge this gap for you. One option here is to give everyone a paper cut out of a fish and have them write their answers on the fish and then place their fish in a fishing net. A southern hemisphere event - it is around the time of the new school year here - if you leave it until after school has started you can easily include the Uni students as well. 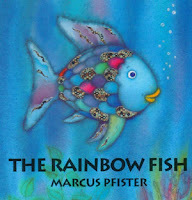 Kids' Story: The Rainbow FishBy Marcus Pfister, 1992, ISBN 1558580093 (pictured at left). This book is basically about sharing but can also be about the fact that even if you feel like the little stripy fish at school, you will always belong to God and the church - and the church is full of rainbow fish. the coloured pieces will remain relatively whole. Thanks to Rev. Rosalind Terry for showing me this moving and memorable activity. 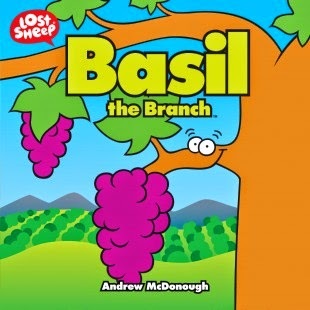 This is another brilliant book by Andrew McDonough, Lost Sheep Resources, 2006. This goes with the Luke reading. The great thing about these books is that they only around $A5 and for a further $A10 (or instead of) you can buy on line the story in any format you need to project the pictures in church. There are also free activity sheets and for a cost activity books for both teachers and children. Visit www.lostsheep.com.au to check out all the excellent resources. Found in Multi-Sensory Prophets by Mike Law, Scripture Union, 2007, ISBN 9781844272587, page 23. This is based on the Isaiah reading. Your blog I have never regreted to read. Keep it up and hope to read more as I follow you. i enjoy your site and all you have to offer. Your photo reminds me of youth camps (many years ago) on Banksia Peninsula. 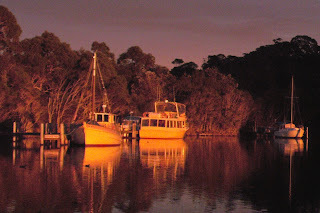 Just last year we took a sentimental journey to Gippsland, hired a yacht and spent 2 wonderful nights moored in Duck Arm.